(a) Using a screwdriver, disengage the 4 claws and remove the 2 covers. (a) Using a screwdriver, disengage the 4 clips and remove the cover. (a) Using a screwdriver, disengage the claw and 3 clips and remove the cover. 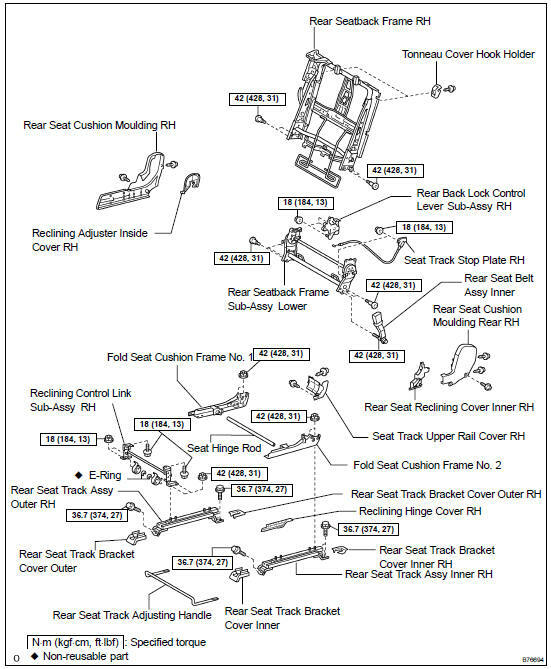 (b) Remove the 5 bolts and seat. 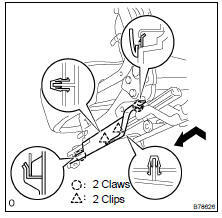 (b) Using a screwdriver, disengage the 4 claws and remove the moulding by pulling it out in the arrow mark direction shown in the illustration. (b) Using a screwdriver, disengage the 5 claws and remove the moulding by pulling it out in the arrow mark direction shown in the illustration. (b) Disengage the 2 claws and remove the bracket cover by pulling it out in the arrow mark direction shown in the illustration. (a) Disengage the 2 clips and 2 claws and remove the hinge cover by pulling it out in the arrow mark direction shown in the illustration. (a) Using a torx) socket wrench (T45), remove the 2 bolts. (b) Remove the 2 bolts and cushion. (b) Remove the hog rings and seat cushion cover. (a) Remove the 2 screws and rail cover. (a) Remove the screw and control lever knob. (b) Remove the 3 screws and seat cover bezel. (a) Using a clip remover, disengage the 7 clips and remove seatback board carpet. (a) Using a screwdriver, disengage the 2 claws and remove the seat lock control lever cover. (c) Disconnect the reclining remote control cable and remove the seat lock control lever. (a) Remove the screw and reclining cover by pulling out the cover in the arrow mark direction shown in the illustration. (a) Remove the screw and inside cover. (a) Using a torx) socket wrench (T40), remove the 4 torx) bolts and seatback frame. (a) Remove the 4 nuts and control link. (a) Remove the 2 nuts and stop plate. (a) Remove the 3 nuts and control lever. (a) Outer side: Using a torx) socket wrench (T40), remove the 3 torx) bolts. (b) Inner side: Using a torx) socket wrench (T55), remove the 2 torx) bolts and seatback frame. Remove the track adjusting handle. (a) Outer side: Using a torx) socket wrench (T40), install the 3 torx) bolts. (b) Inner side: Using a torx) socket wrench (T55), install the seatback frame with the 2 torx) bolts. (a) Using a torx) socket wrench (T40), install the seatback frame with the 4 torx) bolts. (a) Install the control lever with the 3 nuts. (a) Install the stop plate with the 2 nuts. (a) Install the control link with the 4 nuts. NOTICE: Be careful not to damage the cover. (b) Install the cushion cover to the cushion frame. 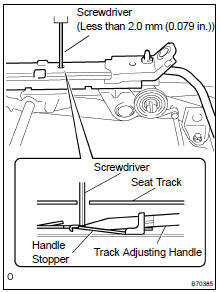 (a) Using a torx) socket wrench (T45), install seat cushion with the 2 torx) bolts. 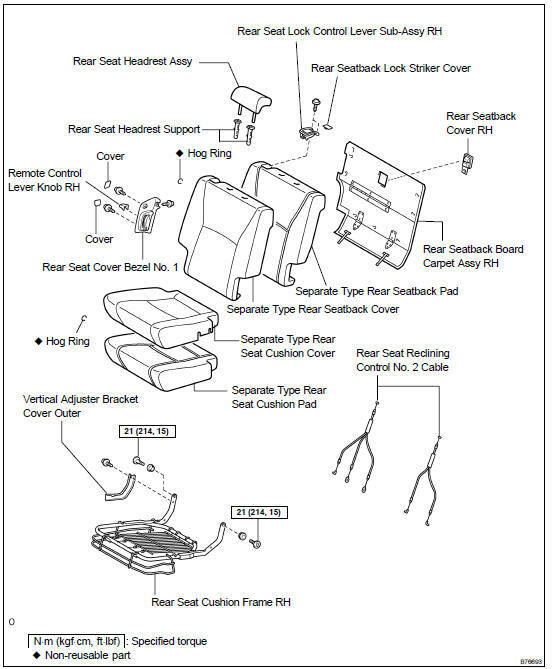 (b) Install the seat cushion with the 2 bolts. (b) Install the seat with the 4 bolts. (c) Install the fold seat stopper band with the bolt on the vehicle side.